Doctors and researchers from all over the world were gathered in Oslo, Norway May 30th-31st 2015 to share the latest knowledge on vector-borne diseases. All together 24 lectures and 4 panel discussions were filmed which amount to around 16 hours of viewing time. The topic was ”Connecting the Dots on Vector-borne Diseases”. 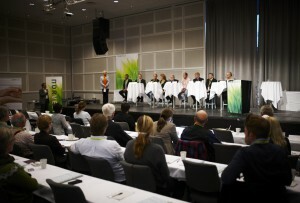 You now have the opportunity to watch the whole NorVect conference at home at your own convenience. Neuropsychiatric Lyme disease – madness or reality? Oslo kvinne tok opp 300.000 kroner i lån for å avslutte Borrelia-mareritt! Woman from Norway had to loan 300 000 NOK (38 000 $) in order to get treatment for Lyme disease. She is now finally healthy thanks to international doctors. Read also the interview with Dr. Richard Horowitz in the article. Borrelia burgdorferi is able to persist in the joint, heart, skin, and central nervous system for the lifetime. A short-term Borrelia burgdorferi infection model identifies tissue tropisms and bloodstream survival conferred by adhesion proteins. Borrelia burgdorferi, the causative agent of Lyme disease in the United States, is able to persist in the joint, heart, skin, and central nervous system for the lifetime of its mammalian host. Borrelia species achieve dissemination to distal sites in part by entry into and travel within the bloodstream. Research	3 years, 8 months ago Comments Off on Borrelia burgdorferi is able to persist in the joint, heart, skin, and central nervous system for the lifetime.